As required by the 1998 edition of NFPA 10. Made of durable polymer material. These collars are available in three different sizes. Each is a different color for ease of identification. Two smallest sizes (1 3/8″ and 1 3/4″) have two years molded, the larger sizes (2 1/8″ and 3 1/16″) have four. Made from 0.025″ thick rigid plastic material. Printed with UV outdoor ink. 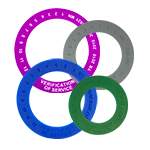 Create your own customized verification collars with any color you prefer. Custom logos can be printed with one or two colors. E-mail your logo and information, and we will develop a proof for your review and approval. 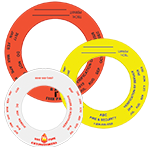 Custom Imprinted Verification of Service Collars comply with NFPA 10. 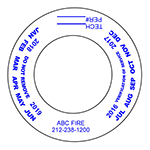 Company Name, Address and Permit # (E#) imprinted. Other custom imprints are available as required by each state (California, Georgia, etc.). Three sizes available.